Chemical peels remove damaged outer layers of skin on the face, hands, neck and chest to smooth texture, reduce scarring and remove blemishes and pre-cancerous growths to produce healthy, glowing skin. There are three different types of chemical peels: alphahydroxy acids (AHAs), trichloroacetic acid (TCA) and phenol. They range in strength from mild to strong and are each designed to provide different results, depending on a patient’s skin condition. A chemical peel can be used to effectively reduce the appearance of wrinkles, age spots, freckles, scarring and blotchiness, as well as improve skin tone and texture by removing damaged layers of skin. This procedure is also now performed on younger patients looking to prevent the signs of aging from appearing too early. A chemical peel can be combined with laser treatment for optimal results. It is important for patients to follow their doctor’s instructions after the peel and to avoid prolonged sun exposure in order to maximize the results of their chemical peel. Our acne facials are designed to be a helpful addition to the typical topical medications, oral antibiotics, and hormonal treatments that are prescribed. Our program has been created to be well tolerated by most acne prone skin types helping to decrease breakouts, improve pigmentation and acne scarring. The procedure done in our office includes cleansing, exfoliating, and hydrating steps to improve the health and appearance of the skin. Talk to your doctor to see if an acne facial is right for your skin. SkinMedica’s line of professional skin care products is dermatologist-developed and available only in approved dermatology offices. The TNS Complex® features a unique anti-aging formula with Nouricel MD. Toners, peels, cleansers, moisturizers, and other products for all skin types are also available. 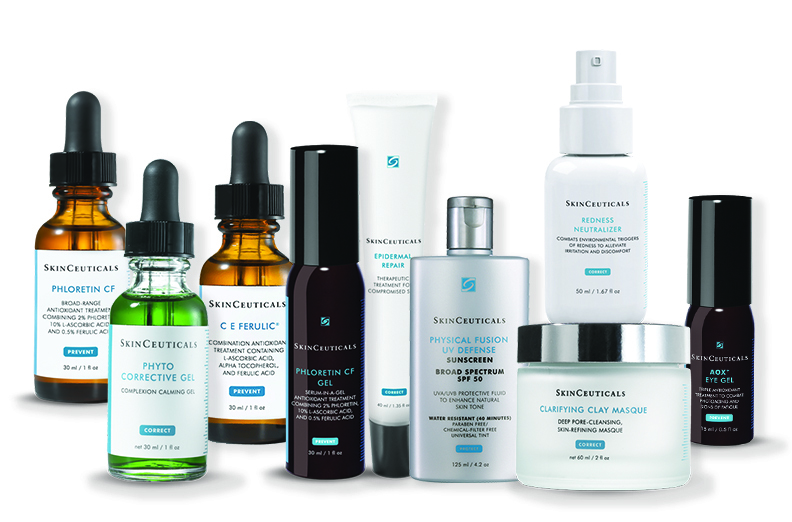 SkinCeuticals aims to create products that can be combined to build a regimen that prevents, corrects, and protects the skin. All of their skincare is “backed by science” and formulated to be optimally absorbed into the skin. The serums, cleansers, and numerous other products offered by SkinCeuticals are designed to improve skin health and attend to any skin concerns you may have. Manufactured by Swiss American Products, Inc., Elta MD® skin care products can be used to enhance and maintain the overall health and appearance of the skin. Products such as cleansers, moisturizers and sunblocks are specially designed to smooth, heal and protect the skin and may be applied on a daily basis. Blue Lizard Australian Sunscreen was developed in Australia, the country with the strictest sunscreen standards in the world. Every sunscreen formulation they offer features broad UVA/UVB protection and a minimum of 6% Z-Cote Zinc Oxide, which provides optimal protection from UVA rays. The Blue Lizard line has a full array of formulas to safeguard even the most sensitive skin, and several of the water-resistant products are designed to last an incredible 240 minutes in water—more than three times the typical water resistance of a sunscreen. Ladera Derm private label products are personally selected by our physicians to meet the unique needs of the patients in our practice. All Ladera Derm products are non-comedogenic and can be safely incorporated into an existing skin care regimen to help patients achieve their desired results. Your doctor will help you determine which products are most appropriate for your individual skin. Latisse is the first and only FDA-approved treatment for hypotrichosis, or inadequate eyelash growth. Latisse is a breakthrough treatment that enhances eyelashes by increasing their length, thickness, and darkness through a daily treatment applied to the base of the upper lashes. This treatment contains bimatoprost, which increases the number of hairs and the duration of the eyelash growth process.